Kaspersky Internet Security is one of the best security suite available for pc that protects our computer from all kinds of viruses, malware, spyware, Trojans, malicious programs and other threats but it is resource-heavy. If installed on a system with low resources, it might make the computer slow. Furthermore, the update process is also slow if you have not updated it for a long time say few weeks. In this article, we’ll see how to distribute updates to several Kaspersky installation offline. For example – In case if we need to format our pc and reinstall os and Kaspersky internet security(KIS), we’ll lose Kaspersky downloaded updates and we need to wait a long time to update it and waste our bandwith (Of course, updating Kaspersky is necessary to remain secured from malicious threats). The developers of Kaspersky knew of such a case so they built an option in KIS to backup all the Kaspersky downloaded updates to a secured location so that you can use that to update KIS on a fresh installation of the program without going online and re-downloading updates. Watch this video or read the tutorial below if you’re on low bandwith ..
Before following this tutorial, make sure your Kaspersky Internet Security is updated (databases are up to date). Create a new folder in any secured drive other than root or windows drive for saving KIS updates. (So, that if you format your windows partition, your updates will still be secured in another partition). Open KIS (launch Kaspersky Internet security). Click on the settings button located on the top right side of the program. Hit on the Updates icon (Web-like icon). Tick box marked ‘Copy Updates to Folder’. Hit on Browse button and navigate to the newly created folder. After selecting the folder where KIS should save the udpates, hit on Apply and Ok button. Since you followed the above process, you should know how to use the saved updates to update KIS later on a fresh new installation. Before proceeding with this part of the tutorial, make sure you followed the above part. Open KIS. Hit on Settings – click on Updates icon. Click on Update Source. In the source tab, click on +Add button. 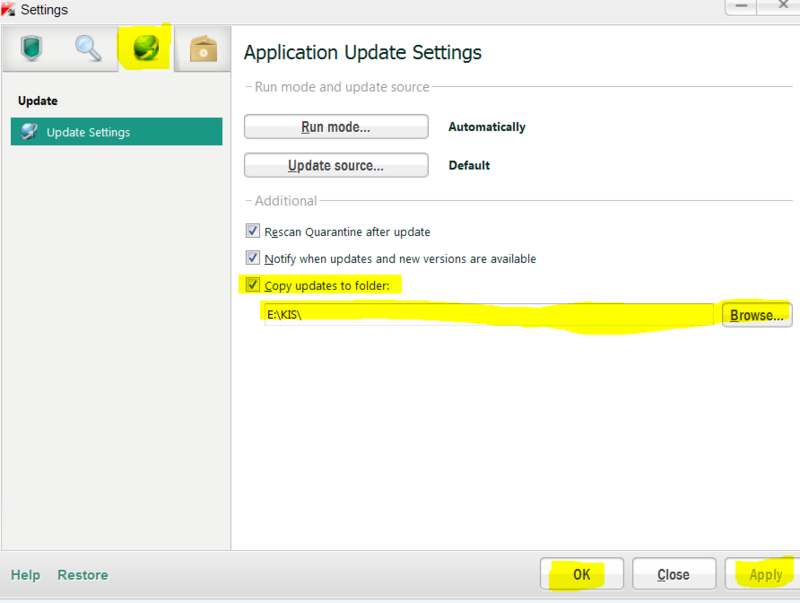 Navigate to the folder where you have saved the updates as explained in the above part of this tutorial. Hit Ok. Remember, Don’t untick Kaspersky Lab update servers. 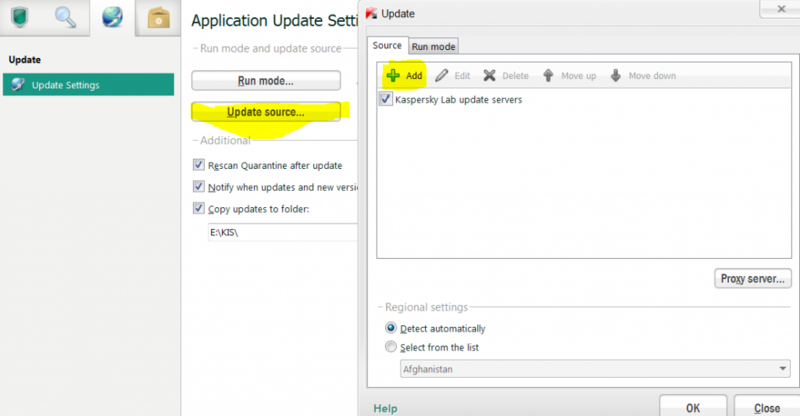 (make sure Kaspersky Lab update servers is checked as well). Done! 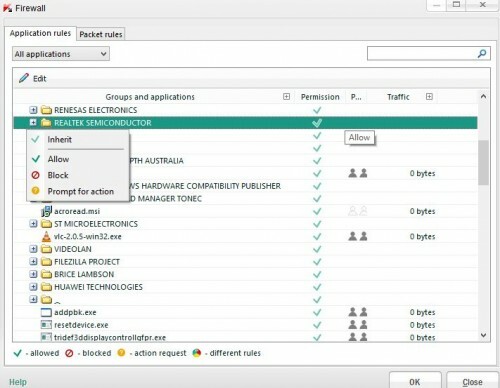 This way you can distribute the updates to any other installation and update it from your offline source without wasting bandwith by downloading Kaspersky internet security updates again. Bonus Tip : You can update Kaspersky Internet Security online via proxy as well. To update via proxy, follow the steps mentioned in the 2nd part of this tutorial to reach to Update Source dialog box and then hit on Proxy button and mention the proxy details manually. The same process applies to Kaspersky Antivirus (KAV).